Being in a sudden tight competition against Overwatch in the first person shooter genre, we cannot let Team Fortress 2 lose player number anymore. Any news or post that there is a new player interested in the game and loving it, we must entertain them with all of our hearts. We, Team Fortress 2 players, cannot go “quit playing noob” on them as we need all the players we could get. Of course, it is just right to be nice to everyone. Who knows, one could be active in TF2 Trading and you can get rewards from them by just being nice. Alright so first of all I’m gonna get this out of the way, I already LOVE this game so far, and I haven’t even played for that long. But there are somethings I need to know because I have never played this game in my life. Every time I level up, I get a new weapon, is this how you get different weapons in the game? I got the quick fix, bow, and the Iron Boomer all within level 10. Is there another way to get weapons other than paying for them? What’s the deal with hats? I don’t have any friends yet, but how do I get them? Are these things I need to buy? What’s the best starter class? I’ve tried Demo, Pyro (my favorite), and Heavy, and these are my favorites, but is there one or two optimal beginner classes? This is The1DragonSlayer’s post in Reddit and I’m sharing this for us to help him out. What can you guys tell him about our great game? Share all your Team Fortress 2 knowledge to this guy. 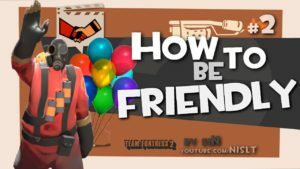 From TF2 Items to TF2 Strategy, let’s guide him through the game!